The European Union provides tons of information online that can be a real treasure. Sometimes there is so much that is difficult to know where to start. An excellent resource is the “Summary of legislation” site, where you can find useful information on the EU in eleven different languages. The site include detailed EU glossaries with clear explanation of 233 key EU terms. But probably the best place to start is the “Eurojargon” glossary (this in 20 languages); a “plain language guide” aimed at untangling for the general public many confusing terms often used by EU insiders. 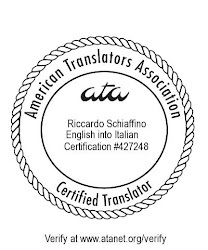 These are not real translation glossaries: they don’t include an easy key to the translation of each term. But since all this material is in at least eleven different languages, it should prove useful to many translators. The links provided here get you to the English version of these pages. In each page you can then select your language. Riccardo, this looks like a great resource, thanks! As far as I know, blogger doesn't support trackbacks. It should be possible, however, to use the backlink feature.